Back in 2004, Black Sabbath released “Black Box”, the definitive remastering of the original eight studio albums with Ozzy. It was well received, and of course, after release, people’s attentions turned to what might come next. There was talk then of a “Black Box II” which would cover the Dio Years. Not much happened then with that because Sabbath was still touring with Oz on the annual Ozzfest into 2005. In 2006, the band was finally inducted into both the UK & US Hall of Fames, and after that, things seemed to settle down, and some folks were thinking that might be “it”. Well, as has happened before, Black Sabbath came back again with Ronnie James Dio, and talks began anew about the box set of the Dio era. While nothing was settled, there was some talk that we would get a box. Then word came down in late 2006 that the “Box” had been whittled down to a single disc, that being “The Dio Years”, which showed up in 2007. Great though it was, some folks felt it a letdown after (falsely, most likely) expecting a full Dio era box set. We skip ahead to 2008, and word comes down during the spring that there would finally be the box set of the Dio era albums. That’s what this is. 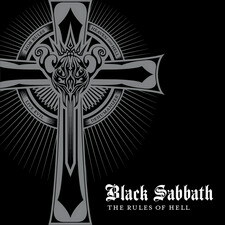 Some commentary about the newly released box set, “The Rules of Hell”, which comprises the four releases from the classic era of Black Sabbath. First off, let me start by quoting my own review of Black Box from four years ago. I said then about Black Box.. “if you’re looking to buy this based on the recent trend of other box sets to include rare songs and things like that, you WILL be disappointed. But if you’re interested in how the songs SOUND, then my god, this is for you.” This holds up again for RoH. Lets get into some detail on that. The physical CDs themselves contain a nice font style writing similar to the fonts used in the original packaging of the particular albums. Black Box did the same thing four years ago, but these feel a bit more readable than those discs. Black on Black is never the easiest thing to read. What do the discs contain? We have the three studio albums from the Dio era of Black Sabbath. Those being 1980’s “Heaven & Hell”, 1981’s “The Mob Rules”, and 1992’s “Dehumanizer”. The live release from 1982, “Live Evil” is also in this box (in its original two disc configuration). The newer releases (The Dio Years, and the Radio City and Hammersmith releases) are not represented. But that’s OK – those are all new releases, less than 24 months old for all of them, so it’s probably right that they weren’t included. Which brings us to our next point – the one I quoted from my Black Box review. “Extras”. As is the case with most box sets, there’s some sort of extras package. The recent Genesis box sets are a treasure trove of extras and whatnot. These things are not here. The four albums are as they were when originally released. The only notable difference here is Dehumanizer. Due to contractual things at the time, Dehumanizer was released worldwide by IRS, but inside the US by Warner/Rhino. The US version of Dehumanizer had a track that wasn’t on the general worldwide release, that being the version of “Time Machine” from the movie Wayne’s World. But that’s it folks. There’s no “sixth disc” of unreleased tracks, demos, and all that. If you’re familiar with the collector’s scene (cough), there are quite a few unreleased and demo tracks from the Dehumanizer sessions that exist (that weren’t used elsewhere), so they could have been, but they weren’t. This isn’t necessarily a bad thing, really. Oh sure, who wouldn’t like to see more tunes? The grapevine says that Tony isn’t a big fan of that kind of thing, and that’s probably why these boxes are the way they are. I did make some inquiries on this subject before the album was released. If you take the “no unreleased demos” as read, there aren’t a ton of tracks that could be included anyway (and before anyone else gives me crap about this statement, I’m talking about real extra tracks – meaning STUDIO TRACKS, not B side live tracks, I don’t count those as real extra tracks). The only tracks I am aware of were the alternate Mob Rules version from the Heavy Metal soundtrack, as well as an alternate version of Dehumanizer’s “Letters From Earth”. That track turned up as a “B side” to the CD single for TV Crimes. I know it exists, I bought it myself in 1992. When I checked into these tracks, I was told by someone at the record label that the Heavy Metal version of Mob Rules couldn’t be used, since it was on another record label. The annoying part was that the guy didn’t even know that version of Letters From Earth existed! It was even on a Warner release – so they have it somewhere in their vaults – that it wasn’t even considered was something personally irritating. Additionally, there is no overall “box booklet”. 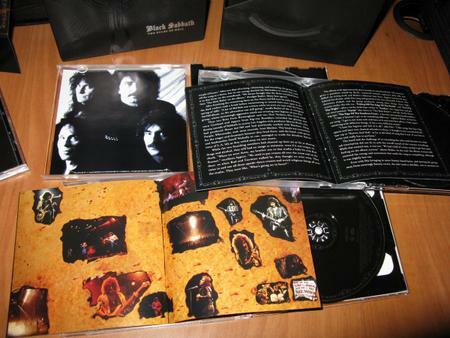 There are booklets with each individual album, but no overall booklet – something that was in the Black Box set. There are jewel case insert booklets with each of the four albums. Each of THOSE has a new story about that particular album’s story as it were. These new stories comprise about 90% of the booklet space, so there is some good reading material. Anyway, that’s enough of the griping. I do admit I tend to be the kind of person who gets worked up over their own little pet minutiae when it is not being served, so I need to let that go. Lets get to the music, which is by far the strongest point of this set. A little history on Sabbath remastering. 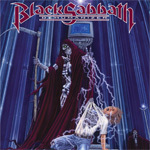 In 1996, Castle Records released new remasters of all the Black Sabbath albums from 1970-1987. 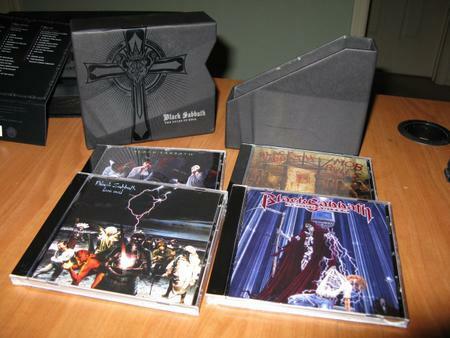 This included two of the three Dio studio albums (and Live Evil). Those masters were from the European master set, not the “Warner Brothers original” (as I’ve come to understand it). These were needed upgrades at the time, and while better than the original CD releases, probably not what I could call “definitive”. Fast forward to 2003, and there was a package named the “Dio Anthology” that covered Ronnie James Dio’s career from Elf through to Black Sabbath and the Dio band. There were a handful of Black Sabbath tracks on this compilation, and they were remastered, as everything else was for that package. Sounded good. Fast forward again to the 2007 release “The Dio Years”, and Dehumanizer tracks were added to the remastering party. This stuff sounded quite good. Was much cleaner than any release at that time. Then we get 2008’s Rules of Hell. This is of course the first time that the entire Dio studio catalog (plus Live Evil) got the full remastering treatment. If you recall, shortly before Black Box came out, there was a two CD greatest hits of the Ozzy era called ‘Symptom of the Universe”, and both Black Box and Symptom were from the same remastering session. Rules of Hell is different in that the remastering work done for this box set was an even NEWER version than the work done for the tracks released just last year! The recordings in Rules of Hell are QUITE fantastic! 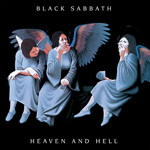 Heaven & Hell: Well, this album by far benefits the most from the remastering work done for this set. This is probably due to the fact that it is the oldest album in the catalogue here, being 28 years old at this point (ACK!). I will say that this is by far the cleanest version of the album I’ve ever heard. It has a freshness that is totally new to me. I know this album very well, it is a metal classic, and even the most ardent “Ozzy only” fan tends to think this is a pretty decent disc. I say that because I think it’s the one most people are familiar with. The single biggest thing here is Geezer Butler’s bass. It’s far more noticeable than it EVER had been before. Oh sure, you knew it was there, but it never stood out. I have a great subwoofer system on my computer at work, and this is where I listen the most. It is REALLY noticeable, and that’s without maxing the bass on the woofer, too. :) This is a great mix, and it makes me wonder why this kind of stuff couldn’t be done before? By far the highlight of the box set for me. The booklet has an new story, and also has some artwork I have not seen before. It’s done by Lynn Curlee, the guy who did the original artwork for the Heaven & Hell album cover (although it wasn’t done specifically for Sabbath). I am unclear as to whether this is truly new artwork, or another of Lynn’s older pieces. Either way, a nice surprise to see in the booklet. 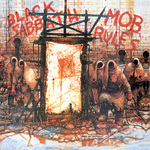 Mob Rules: This album holds a special place for me, because it was the first Black Sabbath album I ever got. As frequent visitors to my site know, I bought this album solely on the cover art. At that time I didn’t know about Black Sabbath, and I saw the cover art in Hit Parader magazine, and thought.. “I wonder what their music sounds like if their cover art looks like THAT!” So I ran out and bought it, and was instantly hooked by the opening riff of Turn up the Night. While I could never recapture that feeling, the new RoH remaster of Mob Rules is a definite improvement over the previous CD versions of the album I’ve owned. This album always (to me) had meaty, somewhat muddled sound. Now this isn’t a bad thing – normally muddled means bad, but this had a heavy low end sound that wasn’t “crisp”, if you know what I mean. This new version keeps that feel I’m having issues describing, yet notches up the clarity. The bass isn’t as noticably pronoucned as it is in the new version of Heaven & Hell, but it is most definitely an improvement. Of course, I’m somewhat biased about this disc, because of what it means to me and Sabbath in general, it’s hard for me to be totally objective about this one. Live Evil: When this album was released on the original Warner set of CD’s it was a double CD. Was one of those “fat” double CD cases from years gone by, if you remember those. The kind now that hold like five discs in the same space. Anyway, when Castle did their remastering in 1996, Live Evil was butchered. Was cut down to a single disc, and almost 100% of the crowd banter was gone. Fortunately, this release restores the album to its original configuration of two discs, allowing for everything to be put back. The problem for me is that no amount of remastering can help this one. When it was BRAND NEW in December of 1982, it was pretty cool. The problem is it feels overproduced to me – the band sounds “flat”, it has no bite, and no crispness. Heck, Geezer Butler himself referred to this album as “Live in the Studio Evil” on a 2007 TV interview. I’ve seen Black Sabbath live a ton of times, and I’ve always wondered where the band’s live energy went on this disc. This is not a complaint about the remastering, but the original release itself. I’ve always felt that Live Evil was an inferior live recording, and while I’ve checked it out as part of my reviewing duties, I cannot say I will honestly listen to this much. The limited release “Live at Hammersmith” from last year beats the crap out of Live Evil. It wouldn’t have happened obviously, but I wish that Hammersmith was included in this package over Live Evil. Having said that, it is nice that its original release format of two discs was included, so in that regard, it is an improvement over the 1996 Castle release by miles. Dehuamanizer: This is the album that benefits least from the remastering. This is probably because the album is the most recent of the studio work in here. I really love this disc, there’s some absolutely stellar tracks on here. It’s not like the remastering work produced NO difference, it’s just the differences are far less noticeable than the other studio albums in here. I’m going to say the least about this one for that reason. 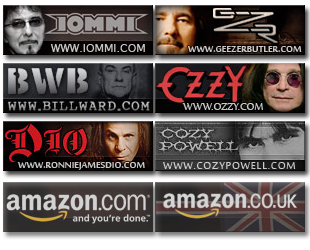 If you look at this review on my Black Sabbath site, it’s enhanced with pictures. These will show you that the inside of the box is four CD jewel cases, and that’s it. Unlike Black Box or the Radio City Deluxe release, there’s no real reason to keep the actual box this comes in if you don’t want to. Since these are just CD jewel cases, and not some custom molded digipak or something, the exterior “box” in the box set can be discarded, and you can put the jewel cases with all your other jewel cases. I’m not advocating throwing it in the trash, as that doesn’t seem right either – it’s just odd that the box set is just that – a box. 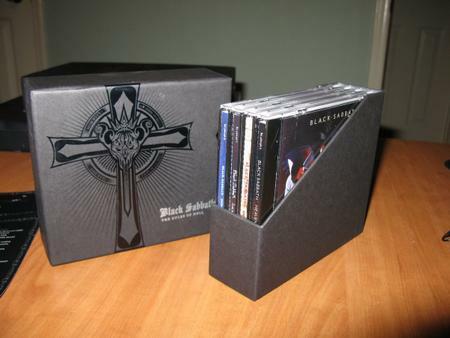 Some box sets have the “box” be part of the packaging, and it all comes together in a nice presentation so to speak. Not here, the box is just “a box”. The exterior has some artwork on it, but it’s that kind of “black on black” that Black Box featured, so it doesn’t really stand out, either. If you’re still with me, you might think that I’m dumping on this box a lot, and that I don’t like it. That is definitely not the truth. If you get all hung up on extras, packaging and the like, well, then you may not like this set. But if you’re like me, and like Black Sabbath for the right reasons, that being the music, then you will absolutely love this set. Heaven & Hell and Mob Rules are seriously improved. Dehumanizer less so, but it does sound better than before, and Live Evil? Well, it’s Live Evil. The pricing on this set is quite nice, too. 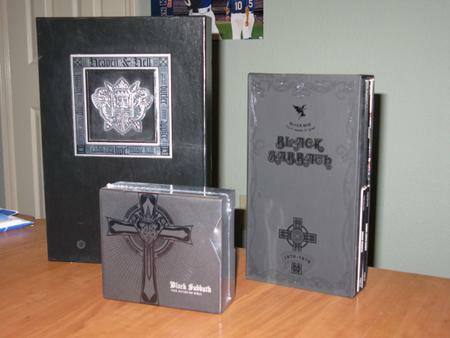 If you’re a Black Sabbath fan that knows these albums well, you’ll find a lot to like about the remastering. If you don’t have these albums, it should be a no brainier – go get them. They’re classic pieces of metal, and the remastering does wonders for them. You’ll enjoy it. Some other notes. I’ve been told that this is a North American release (like most recent Rhino stuff). I did inquire as to whether or not it will be released outside of North America, and I cannot get a concrete update on that. It would have been nice if the three studio tracks from the Dio years package could have found their way onto here. They actually are, if you buy the box set from a digital format (such as Amazon’s MP3 store, or iTunes or the like), but the physical disc version does not have them. 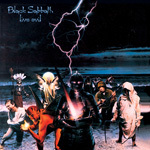 Geezer Butler has said that the title of the box is not for the obvious “Hell” connection, but it’s a play on the names of the first two albums with Dio. 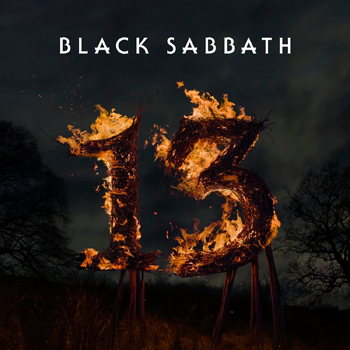 Granted, Sabbath has never been above playing the “Satan” angle for marketing (look at the box cover art), but I personally find these kinds of album names tiring. Yawn. It’s Satan again. Can we move on to something more important than that? That’s it for me and my review of “The Rules of Hell”. Hope to see you back here again before too long with a review of “Black Box 3: The Everything Else” box set. Oh, you can see my photo gallery of the images used in the review here, which includes a couple of others not used in the review. A special thanks to Rhino Records who provided the copies for the giveaway I ran last week. Go support the band, and buy the box! Here’s some ordering links. If you don’t care about physical media, check out the digital versions. They’re priced well (iTunes is $24.95 and Amazon’s MP3 store is $22.95 as I write this). Both the digital links come with the three new tracks “The Devil Cried”, “The Shadow of the Wind”, & “Ear in the Wall”.